High levels of a toxic radioactive isotope have been found in groundwater at Japan's Fukushima nuclear plant, its operator says. 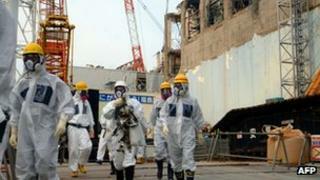 Tokyo Electric Power Company (Tepco) said tests showed Strontium-90 was present at 30 times the legal rate. The radioactive isotope tritium has also been detected at elevated levels. The plant, crippled by the 2011 earthquake and tsunami, has recently seen a series of water leaks and power failures. The tsunami knocked out cooling systems to the reactors, which melted down. Water is now being pumped in to the reactors to cool them but this has left Tepco with the problem of how to safely store the contaminated water. There have been several reports of leaks from storage tanks or pipes. Detecting increasing levels of the highly radioactive substance Strontium-90 indicates that Tepco is still struggling to contain the Fukushima reactors. Water continues to be a massive problem as the company is running out of storage space for the large amounts of the liquid they use every day as to cool the plant. On top of that around 400 tonnes of groundwater flow into the reactor buildings every day. They have even dug up 12 relief wells near the site in an effort to halt the ingress. As to the high levels of Strontium-90 detected, it has a half life of 29 years. This means that in humans it can continue to irradiate them for many years. It can be ingested from food or water and tends to concentrate in the bones and is believed to cause cancer there. In animal studies, exposure to Strontium-90 also caused harmful reproductive effects. These effects happened when animals were exposed to doses more than a million times higher than typical exposure levels for humans. Strontium-90 is formed as a by-product of nuclear fission. Tests showed that levels of strontium in groundwater at the Fukushima plant had increased 100-fold since the end of last year, Toshihiko Fukuda, a Tepco official, told media. Mr Fukuda said Tepco believed the elevated levels originated from a leak of contaminated water in April 2011 from one of the reactors. "As it's near where the leak from reactor number two happened and taking into account the situation at the time, we believe that water left over from that time is the highest possibility," he said. Tritium, used in glow-in-the-dark watches, was found at eight times the allowable level. Mr Fukuda said that samples from the sea showed no rise in either substance and the company believed the groundwater was being contained by concrete foundations. "When we look at the impact that is having on the ocean, the levels seem to be within past trends and so we don't believe it's having an effect." But the discovery is another setback for Tepco's plan to pump groundwater from the plant into the sea, correspondents say. Nuclear chemist Michiaki Furukawa told Reuters news agency that Tepco should not release contaminated water into the ocean. "They have to keep it somewhere so that it can't escape outside the plant," he said. "Tepco needs to carry out more regular testing in specific areas and disclose everything they find." The Fukushima power plant has faced a series of problems this year. Early this month, radioactive water was found leaking from a storage tank. The plant also suffered three power failures in five weeks earlier this year. A leak of radioactive water from one of the plant's underground storage pools was also detected in April.